The £16 million, UK flagship programme of Arctic research returns today on a scientific cruise to the Arctic Ocean. 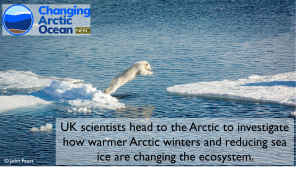 Funded by the Natural Environment Research Council (NERC), researchers from institutes across the UK are heading to the Fram Strait region between Greenland and Svalbard to look at the effects of warming on Arctic marine life. With warmer winters across the polar region, the Arctic Ocean is now experiencing year-on-year record lows of sea ice. These changes are having an unprecedented impact on how the Arctic ecosystem operates. 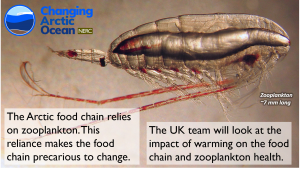 Changes to the lower part of the food chain are a serious concern because this is dominated by one type of zooplankton (copepods, small crustaceans the size of a rice grain). As fish and other species rely on zooplankton for their main source of food, the Arctic food chain is precarious in the face of climate change and susceptible to dynamic change. 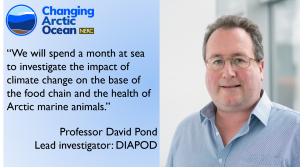 The on-board scientists from two of the programme’s projects will spend a month at sea looking at how these zooplankton are coping with a warming Arctic Ocean (DIAPOD project), and the impact of warming on the Arctic food chain (ARISE project). The scientists will collect zooplankton samples and examine them to check how healthy the animals are. The environments the zooplankton live in will also be investigated by sampling the water column for its chemical composition and by looking at seafloor sediments using a camera. Climate change has a devastating effect on our planet, from melting polar ice caps to rising sea levels and I am proud the UK is leading the way in tackling this harm. World-class researchers from 18 different UK institutes will be undertaking this vitally important work and through our modern Industrial Strategy we have committed to investing 2.4% of GDP on research and development to help tackle major global challenges. We have a busy and exciting schedule of science ahead of us. We will use specialised nets to catch the zooplankton from the surface down to depths of 2 km in the Fram Strait region. We will be conducting on-board experiments to study how environmental change is impacting on these animals. We’re particularly interested in understanding if this key Arctic food source is showing signs of change in its behaviour or abundance. It is important to understand how the Arctic Ocean is responding to a changing environment, and it is vital we are able to detect change to the Arctic ecosystem above natural ecosystem variability. Overall, ARISE will use a combination of biological markers at the base of the food chain and in Arctic seals alongside seal population ecology and mathematical models to develop a new framework to detect long term change in the Arctic Ecosystem. 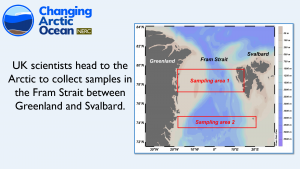 During the cruise to the Fram Strait, we will capture the biomarker signals at the base of the food chain during a key transition period from winter to spring in the Arctic. The ARISE team will be busy collecting large quantities of seawater, phytoplankton and zooplankton for biomarker analysis back in our laboratories. The ultimate goal of Changing Arctic Oceans is to generate a better understanding of the Arctic so models can more accurately predict future change to the environment and the ecosystem. Within the programme there are four main projects with more than 80 scientists combined, from 18 UK research institutes.